Staying for Christmas hols in Nana’s in Bargoed, South Wales; the festive season started today with a nativity play at church and then the three generations planned how to carry on their festive activities. 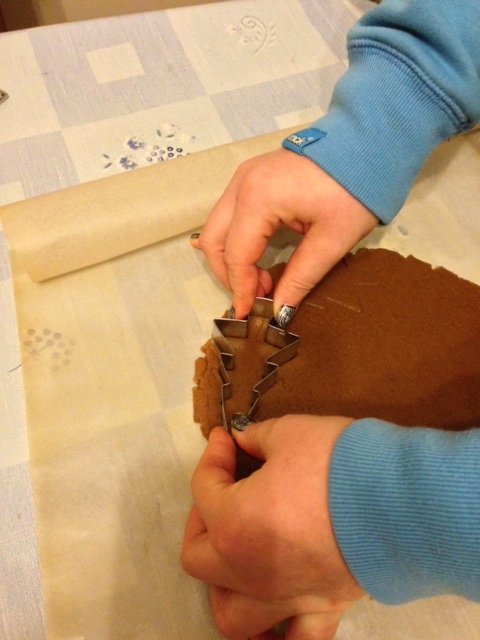 Ice skating, going to see The Hobbit, making paper chains and baking gingerbread were all on offer, but it was the excitement of making a Gingerbread House in Gingerbread Land that won the day. 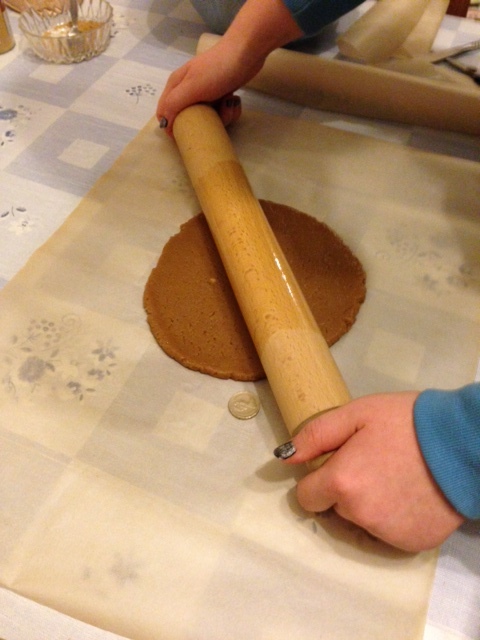 Since no one had ever made gingerbread before it was going to be a challenge. 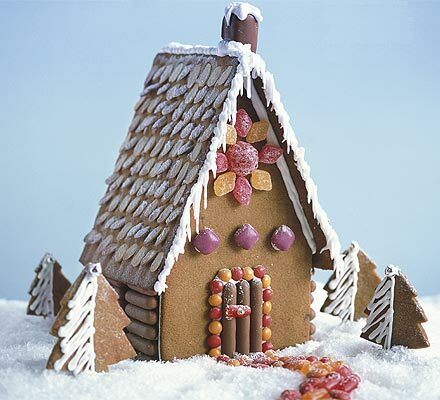 First stop… Google….. to search a recipe….It was the BBC good food recipe that was decided upon for the gingerbread and then the design would be adapted to decorate the house…. out with the almonds on the roof and in with chocolate buttons, etc. 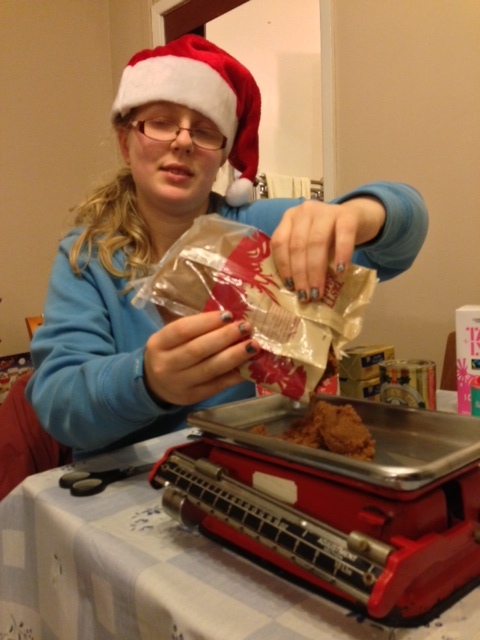 Plus a rolling pin, baking trays, foil, greaseproof paper, wooden spoon, tablespoon, teaspoon and mixing bowl. Nana, the Generation 1 non-chef, was asked which of the above she had in her kitchen. Her response? 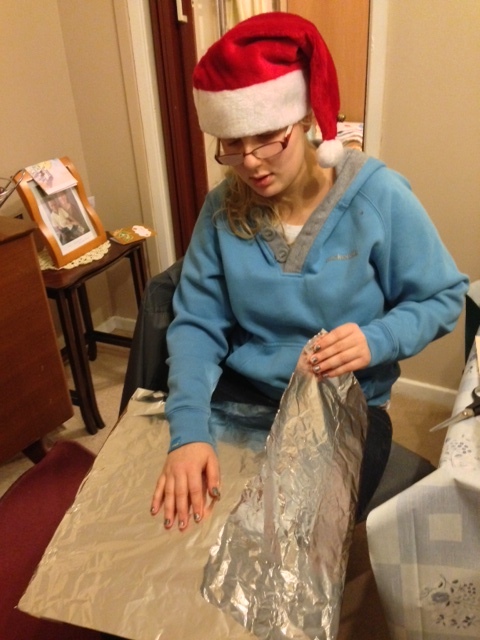 A rolling pin, a baking tray, spoons and a bit of foil….. time to go shopping…. 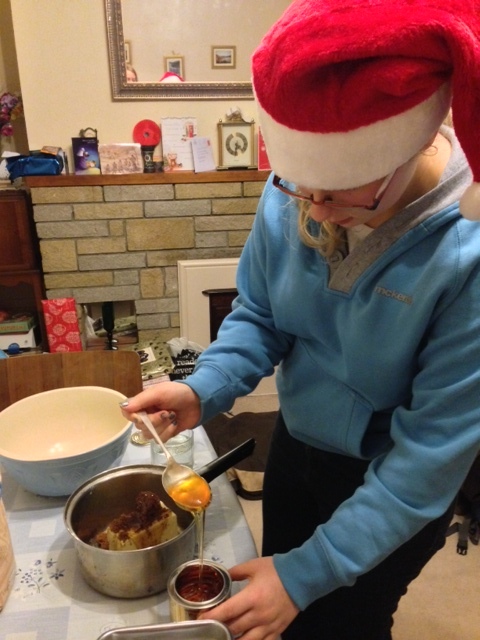 not even a mixing bowl in sight! 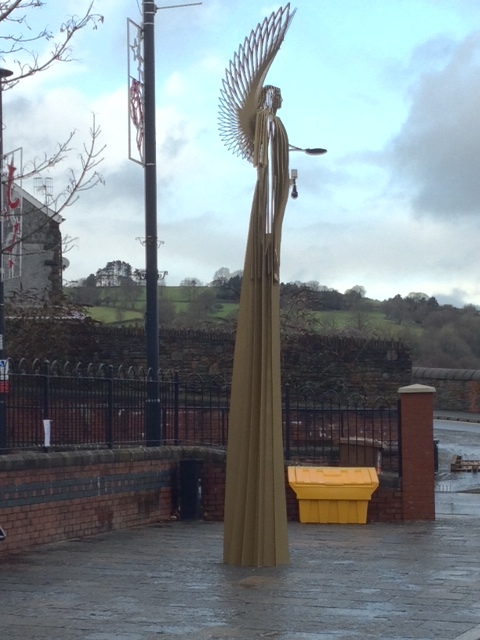 The trip to Bargoed’s new attraction…. 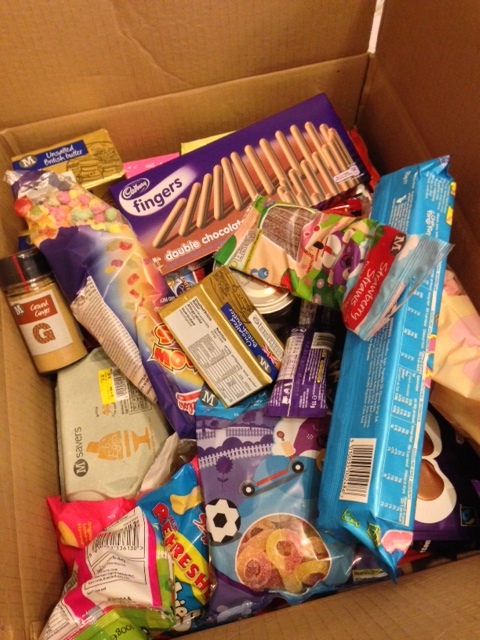 Morrison’s supermarket…… yielded thousands and thousands of calorie-filled sugar and fat!!! And the box was kindly donated by a shelf stacker after he had unloaded his trays of frozen raspberries. 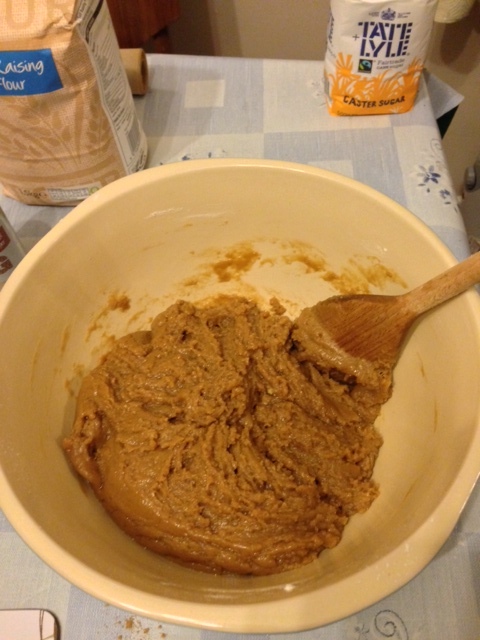 Ingredients in place, it was time to start baking. 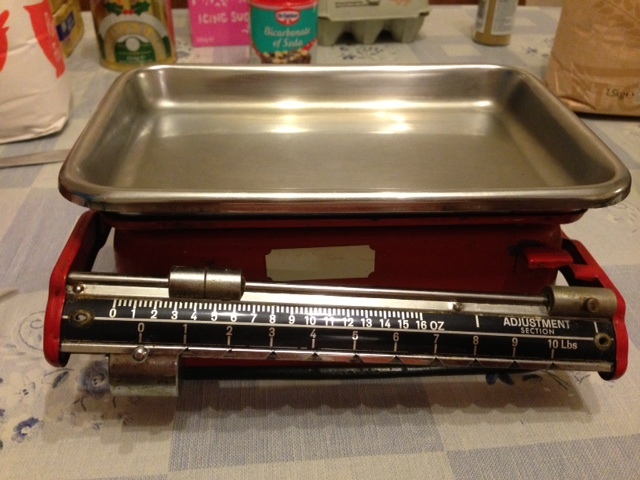 But the one thing that had been forgotten in the rush was a weighing scales; yet another piece of essential baking equipment missing from the Generation 1 kitchen. It was time to ring the neighbours! A lady kindly popped round with a red contraption that looked like it had come from a museum. Then came the history lesson….. we were asked how much we wanted to weigh. The answer of 600g was looked upon in despair. Awch!!! It only measures in pounds and ounces!! Back to Google to find out conversion rates, and after some debate over how many ounces in a pound and 1.3lb not being equal to 1lb 3oz, it was time to start weighing the ingredients. 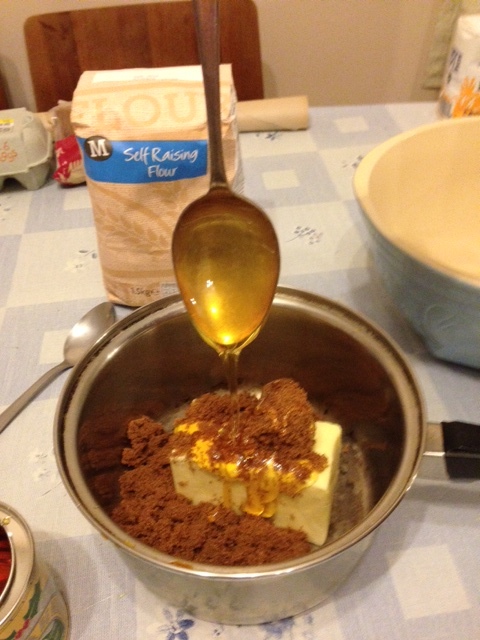 The 250g of butter and 200g of brown sugar were put in the saucepan (pronounced sospan in Wales!!) 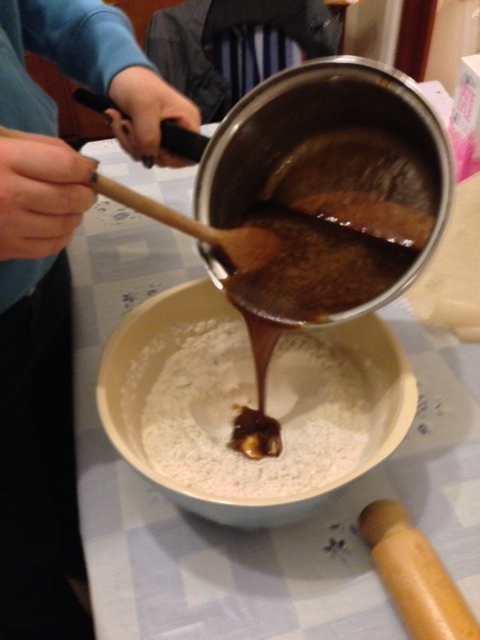 and then a tablespoon found to measure out the 7tbsps of syrup. 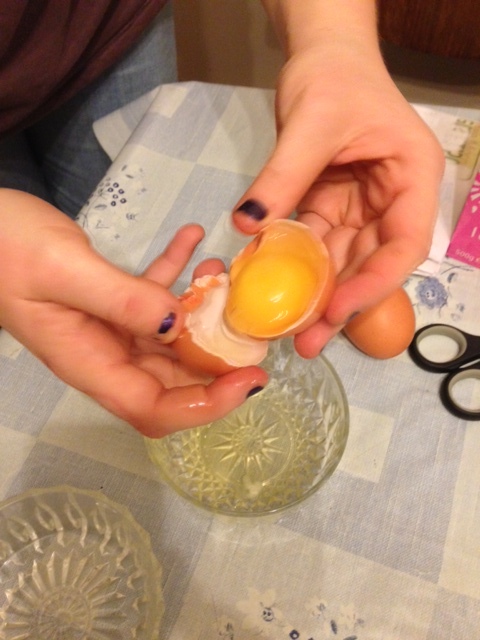 Generation number 2 dipped it into the syrup tin to be greeted by Generation 3 saying “If you were a chef you would have put the spoon in boiling water first and then it comes off easily”. 2 seconds 2 late!! 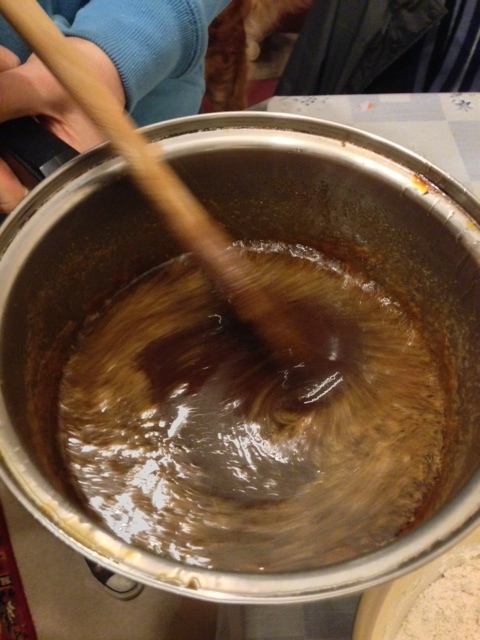 Now two spoons were covered in syrup as one was used to scrape the syrup off the other spoon. Generation 2 was sacked and Generation 3 took over! Good to know she was taught something useful in school! This was then heated over the stove until everything melted. 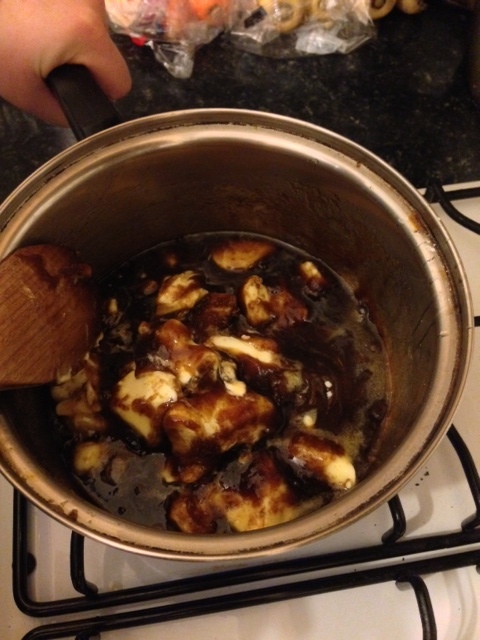 After which time the dry ingredients of 600g of plain flour, 2 tsp of Bicarbonate of Soda and 4 tsp of Ginger were placed in a bowl and a dip made in the centre; into this the melted mixture was poured. 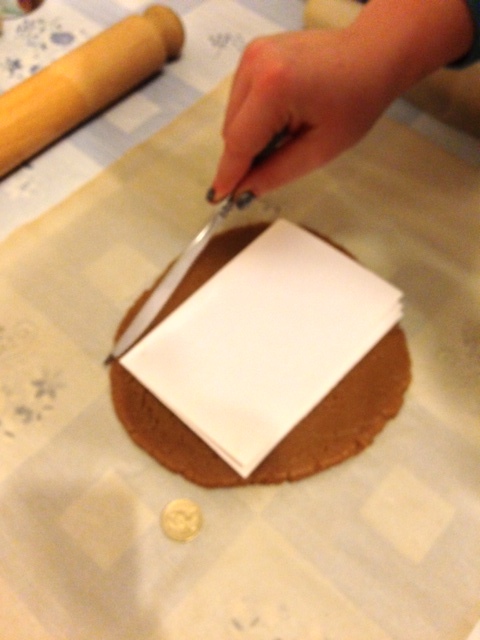 This was then gently mixed together…..
Then rolled out on some greaseproof paper to about the thickness of 2 £1 coins. 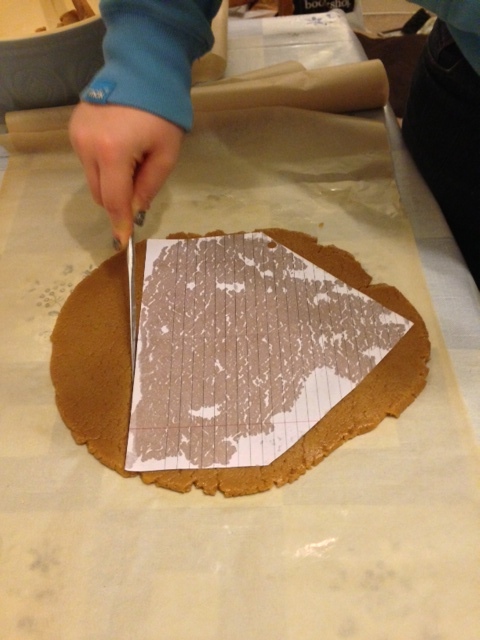 The three Generations did not have access to a printer to print out the Gingerbread House plan from the BBC Food Guide website, so it was time to quickly design a template and use it to measure the gingerbread walls and roof. Care (although in hindsight perhaps not enough!!) was taken as a fatal flaw here could mean construction problems. 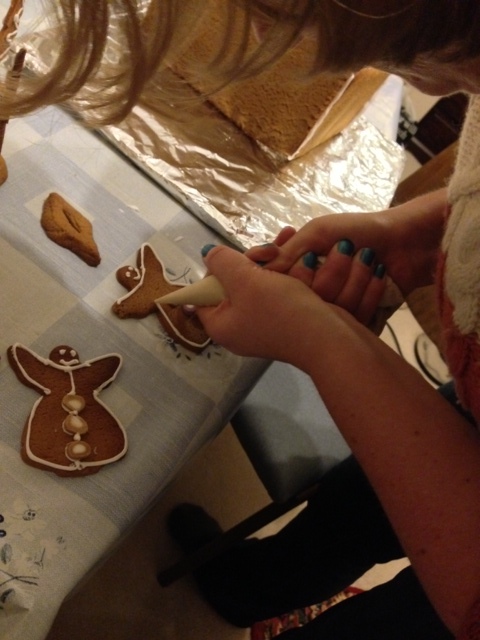 The leftovers were used to make trees for the gingerbread forest, Hansel and Gretel, and stands to help them all remain upright. 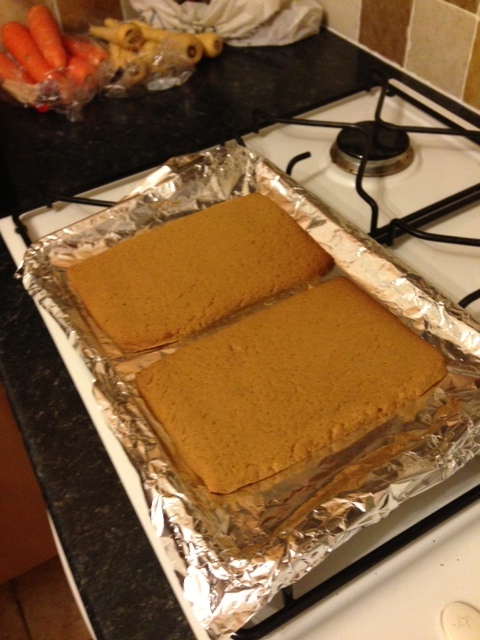 Then, with just one baking tray lined with foil, the first walls were placed in the oven at 180 degrees C for 12 minutes. While each tray was baked and cooled the ‘cement’ for putting the house together was made, with two egg whites mixed with 500g of icing sugar. 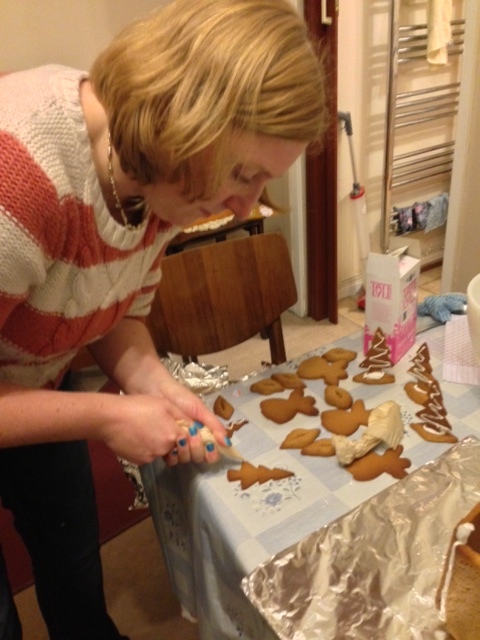 Then the trees were decorated using an icing bag made from greaseproof paper, and Hansel and Gretel put on their coats with three dolly mixture buttons…. They were then stood up on their bases. 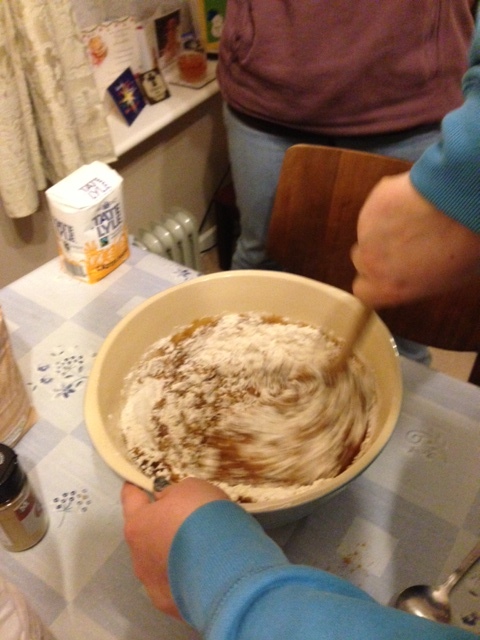 But next came the big challenge; the walls had expanded on cooking, some were larger than the others, and because they were cooked one after the other rather than together (due to lack of baking trays and lack of oven space) this was not realised until they were cool. Oh dear, sticking them together was a challenge. This was left to cool for a few hours while the Christmas tree cookies were decorated to give to friends. 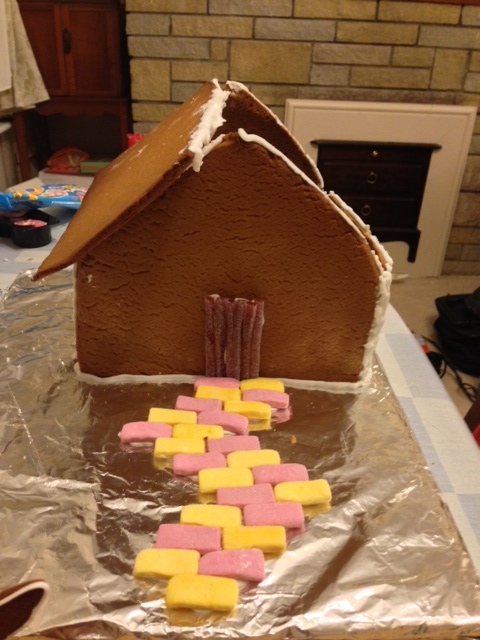 The door was added made from sour strings and the path with fizzy tiles. There was a cut made in the roof top for the chimney and an attempt was made (and failed) to put it on the roof. The roof fitting ended in disaster, with walls about to collapse and roof panels sliding off as the icing seals had not set. Just as Generation 2 thought all was well, the chimney fell in and one panel fell off….. 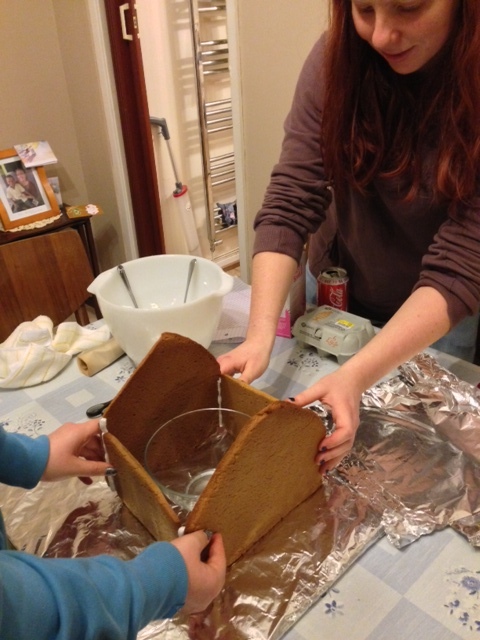 It was decided to leave one panel on for it to set overnight and to try the other again tomorrow… so watch this space and see if we manage to get a half decent gingerbread house and garden constructed.